Last Updated: August 15, 2017 | Subscribe to our weekly newsletter! Mosquitoes are so much worse than just irritating little bugs who make you look maniacal when you try to wave them away. They carry life-threatening diseases such as West Nile Virus and Zika Virus. Though only certain species pose a major threat, you have no way to know until you’ve been bitten. Because mosquitoes love water, humidity, and flailing humans, your pool area is the perfect place for a mosquito buffet. Don’t put up a neon “All You Can Eat” sign. Protect your family’s health by taking a stand to keep mosquitoes away from your pool. The United States Environmental Protection Agency (EPA) and the Centers for Disease Control and Prevention (CDC) worked together to create best practices for municipalities working on mosquito control. They advise organizations to take an approach they call “Integrated Pest Management,” which includes removing mosquito habitats, controlling mosquitos at all life cycle stages, and using structural barriers. We’ll help you take the same professional approach in your own backyard. 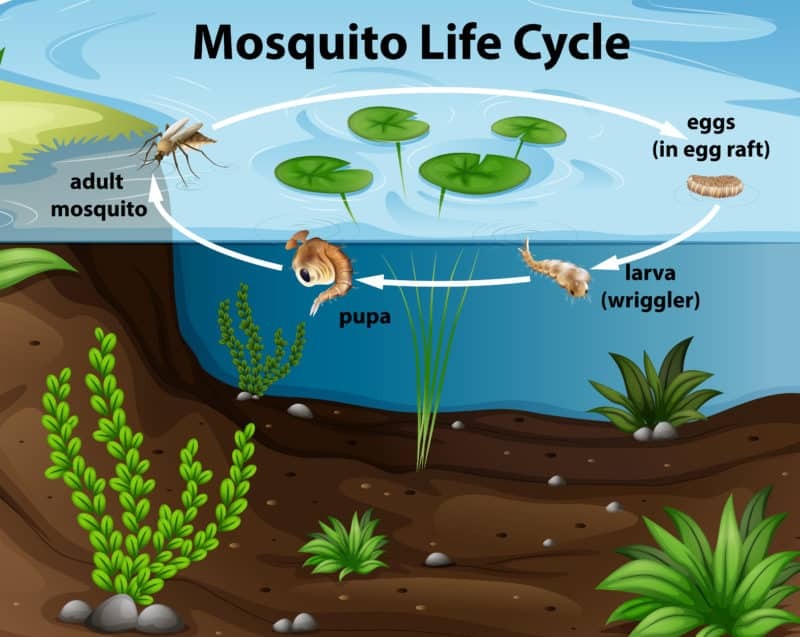 Of their four life cycle stages, mosquitos spend three of them in water. Mosquito eggs hatch, become larvae, then grow into pupae, all in water. Mosquitoes don’t bite during those stages, but they will when they mature. You can minimize the adult population by taking steps to rid your yard of mosquito breeding sites. Inspect your yard after a rain, and you may be surprised to find places where water lingers. Mosquitoes grow from eggs to biters in about two weeks, but eggs can survive for months waiting for water to help them hatch. Turn over buckets, recycle old tires, and fill in areas of your yard that stay damp. For things you can’t empty, such as wading pools and fountains, change the water weekly. Also, mosquitoes can’t breed and develop in moving water, so if you have a fountain or other water feature, keeping it in motion will help prevent mosquitoes from moving in, getting comfy, and getting busy. When your pool isn’t in use, keep it covered. Although it’s unlikely your pool water will ever be completely still, it can be inviting to mosquitoes, and look like a good place for them to lay their eggs. Yuck! Keeping your pool covered when you’re not using it can help keep your water bug free. Of course you don’t want to pull out your safety cover every time you get out of the pool. What a pain that would be! Your best bet is actually a solar pool cover. Not only will it cover most of your pool’s surface and make it unattractive to determined mosquitoes, it can actually help heat your pool, and reduce evaporation. This will also help you save money on energy, water, and chemicals. It’s a quadruple win! Mosquitoes love piles of soggy leaves, rotting logs, and tall, wet grass. Mow regularly, so you won’t have lots of grass clippings to deal with. Rake and dispose of leaves, pine needles, or palm fronds. Rotting logs should also be disposed of. Pay special attention to areas that stay moist, such as underneath decks. Keeping those areas free of organic debris allows the water to drain into the ground or evaporate into the air before it becomes home to mosquito larvae. Do you have old, knotty trees on your property? Trees with holes provide homes for several types of animals and insects. But if your tree hole holds water, it may also be a place for mosquitoes to lay their eggs. To safely eliminate this problem without killing your tree, fill it with expanding foam insulation. The foam will seal off the hole without adding weight to the tree trunk. You can cut off any excess foam that comes out of the hole. Expanding foam can even be sanded and painted to blend in or match decor. Note: Only fill in a tree hole if you’ve verified that it holds water. Tree holes that do not hold water can be homes and nesting sites for birds and other wildlife. If there’s a way for mosquitoes to get into your septic tank to lay their eggs, they will find it. Search for any place they could get in, such as uncovered ventilation pipes, cracks in the tank walls, and gaps in the septic tank cover. Cover ventilation pipes with screen mesh tight enough to prevent insects from flying through. Use cement to repair your tank walls. Replace tank covers that don’t have a snug fit. If you have an abandoned septic tank on your property, consider filling it in to keep it from turning into a big mosquito condo unit. If your pool is full of clean, balanced water that’s being turned over by your pump every day, it won’t be habitable for mosquitoes. Keep up with pool maintenance, such as cleaning your filter and skimmer regularly. Create and stick to a pool maintenance schedule to be sure your pool stays clean, clear, and pest free. Once you’ve gotten rid of mosquito habitats on your property, it’s time to get rid of the blood suckers. Well, only adult female mosquitoes feed on blood, but they need males to breed, so we’ll help you get rid of all the mosquitoes at every stage of their life cycle. Different types of pesticides kill insects at various stages. Larvicides kill mosquito pupae and larvae. They come in several forms: liquid, tablets, pellets, granules, and briquettes, but all are used the same way. You place the larvicide in water where bug babies are likely to be, such as gutters, septic tanks, on top of pool covers, and in non-chlorine swimming pools or wading pools. The EPA registers larvicides and maintains information regarding their safe use around people, pets, and in the environment. Pesticides that kill fully grown mosquitoes–you know, the ones that bite–are known as adulticides. They come in several forms, including sprays, aerosols, foggers, and coils. Some of them can also be used indoors. For your pool area, be sure to choose products made for outdoor application. Pay special attention to moist, dark areas where mosquitoes like to hang out. You’ll also want to avoid spraying adulticide near fruit, veggie gardens, or blooming plants that attract pollinators, such as bees and butterflies. Want to rid your property of adult insects without hiring a pro or constantly spraying by hand? Check out mosquito misters. For small areas, you can try inexpensive hanging lanterns that spray a pesticide mist. To get more coverage over a larger area, consider installing a full system with a reservoir unit that feeds pesticide through tubing to misters all around your property. While these systems may be convenient, you have a few important considerations before you buy. The pesticides used in misters may not be regulated by the EPA, but are regulated by some states. Be sure to check your state’s regulations about the pesticide you plan to use. Follow the manufacturer’s instructions to the letter, and proceed cautiously with any pesticide use. Now that you’ve seen the recommendations and some warnings about pesticide application, you may be wondering about more natural ways to combat mosquitoes. One way to eradicate problem insects is by introducing some of their natural predators to the environment they’ve invaded—in this case, your yard. Three of the most effective mosquito killers are bats, dragonflies, and mosquito fish. But just how effective might it be to use them in your fight against bloodsuckers? Harmless and beautiful, these flying insects are mosquito-eating machines. Attract them to your yard with a predator-free pond featuring tall plants, such as cattails or reeds. They typically lay their eggs on the water, with some dragonflies inserting their eggs into the stems of water plants. You don’t need a huge pond to attract them, either. A simple water feature in a small garden will do it. Mosquito dunks, a mosquito larvicide, can be used to keep the mosquitoes from breeding in your pond without harming dragonflies, honeybees, or other critters in your pond. Ever heard of these guys? They’re an excellent natural predator to add to your pond or garden water features. Some vector control agencies will even give them to you for free because controlling mosquitoes on your property helps everyone. 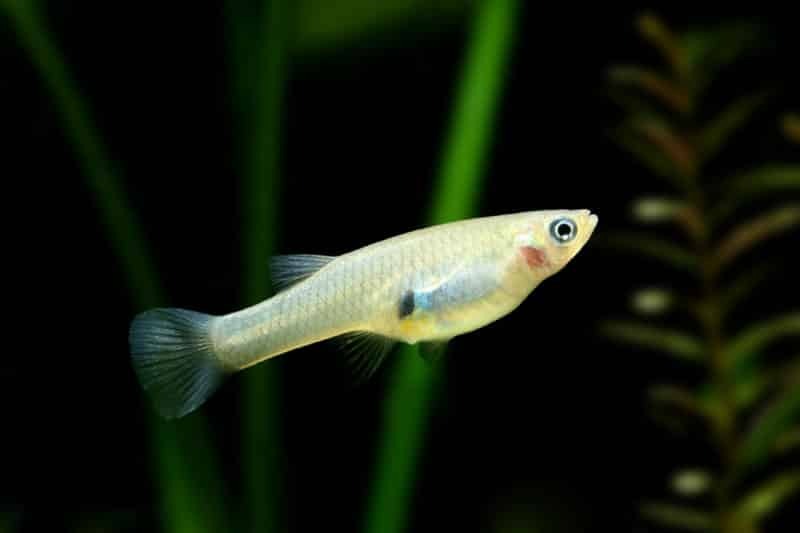 However, mosquito fish (also called Gambusia affinis, or simply Gambusia) are such vicious little larvae hunters that they can cause trouble when introduced into the wrong environment, so they’re regulated in some places. Be sure it’s legal in your state to keep them in your pond. Animals whose diet consists of insects are called insectivores, and this includes some species of bats. Their diets consist mostly of moths, beetles, wasps, and to a lesser degree, mosquitoes. While they may not be as effective against mosquitoes as other predators, some insectivorous bats can help keep your yard and pool area clear of several other pests. Let’s be clear—we do not recommend that you actively try to attract bats to your yard. Bats carry and transmit some dangerous diseases, such as rabies and histoplasmosis. However, if bats already live on or near your property, rather than trying to get rid of them, we recommend that you simply leave them be, and let them do their thing. They’re nocturnal, which means they’ll be out at a time that you’re less likely to be in your pool. And their goal when they’re out and about is to eat bugs and stay as far away from humans as possible. Leave them alone, and they’ll leave you alone—and do you a favor by eating about half their weight in insects every night. Emptying buckets of rainwater and spraying for mosquitoes will help put a dent in their population on your property. However, you can take steps to make your whole swimming pool area less inviting for mosquitoes. So, roll up those soggy welcome mats and give those bugs the boot. 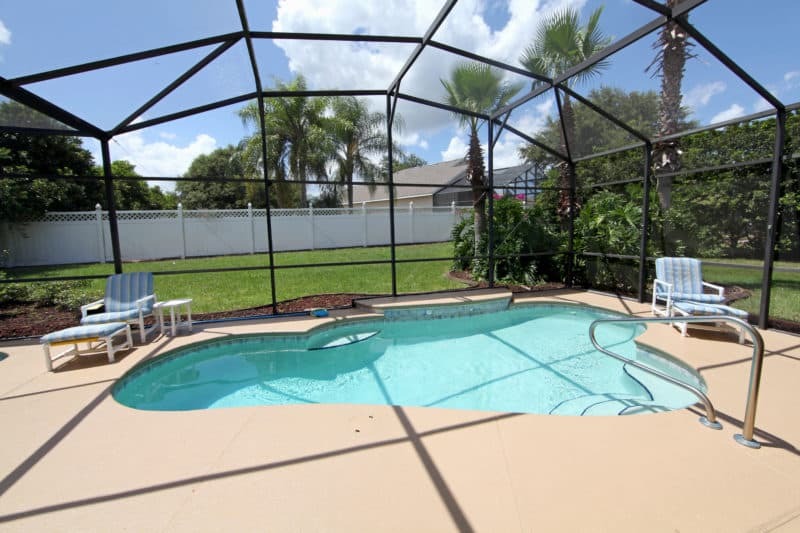 If you’re a native Floridian, the sight of a screened in pool enclosure is nothing new to you, but for some folks, this product is totally foreign. It’s basically a big room made of mesh, glass, or fiberglass built around and over your pool area. Pool enclosures help keep bugs, debris, and possibly some ultraviolet rays (depending on the enclosure’s material) out of your pool area. Some of them can also withstand high winds, which can protect your pool from evaporation. But just like a screen door, one little rip in a mesh pool enclosure (or a gap in a glass or fiberglass one) can let all the bugs in. Inspect your pool enclosure often, and repair rips and gaps as soon as you find them. Long, flowy drapes can not only enhance your pool area, they help keep the bugs away, too. Whether you choose fabric curtains or bug nets, surrounding your pool or patio area with these will help shelter you from mosquitoes. Hang curtains from your pergola, pavilion, or lanai roof. Use a track or tie-backs to open them during the day, then close by dusk when the mosquitoes come out to play. Stinky feet and Limburger cheese are attractive to mosquitoes. Just as those odors draw the insects in, could the scent of certain plants repel them? Maybe. Marigolds, basil, lavender, catnip, garlic, and a handful of other plants are said to repel mosquitoes, though it can be difficult to find any actual scientific evidence to support this claim. If nothing else, marigolds are pretty, lavender smells nice, you can use basil and garlic in the kitchen, and your kitty will love the catnip. Bulbs of a certain color are outside the spectrum of light bugs can see, so they don’t attract insects. While the science behind yellow bug lights makes sense, they’re not a perfect solution on their own. A study by the American Association for the Advancement of Science found a warm temperature, standard LED attracted even fewer insects than a “bug bulb,” though both effectively reduced bug draw. Have you heard that mosquitoes can’t fly through the wind created by a fan? It’s true! Even the American Mosquito Control Association recommends using a large fan near outdoor gatherings to keep the insects away. Apparently, mosquitoes are weak flyers, so they really can’t get past the breeze from the fan to bite you. Diethyltoluamide, better known as DEET, is probably the most effective mosquito repellent on the market today. In fact, it’s in all three of the top performing insect repellents from a study of bug spray protection times published in the New England Journal of Medicine. You can also try products that contain IR3535 (a synthetic repellent found in products like OFF! or Avon Skin So Soft Bug Guard Plus), or 2-undecanone (a synthesized version of a compound found in rue, wild tomatoes, and several other plants), though they may not be as effective. The EPA provides a handy tool for finding the best, EPA-registered mosquito repellents for you. You probably can recall barbecues from your childhood surrounded by citronella tiki torches or those familiar tin buckets with a stinky, yellow candle inside. Even though citronella can be somewhat effective at preventing mosquito bites when applied topically, the candles have proven to be pretty worthless. A fan is much better investment for your patio than citronella torches and candles. Using a variety of attractants, such as carbon dioxide, and various methods of containment, mosquito traps lure, then kill insects. The insects are either sucked inside to die, trapped in a sticky fly-paper substance, or electrocuted. While all of that sounds very final, the use of attractant can be problematic, attracting more mosquitoes than the trap can handle. Remember that while no single solution will solve your mosquito problem, mosquito traps may be a useful component of your integrated approach. Mosquitoes are drawn to certain smells, hormonal changes, and chemicals. One major draw for mosquitoes happens to be carbon dioxide. If you really want to avoid being bitten, just hold your breath. Or at least, try not to breathe as much as the person next to you. Just kidding! Stick with those EPA-registered repellents, put up some environmental barriers, and invite natural mosquito predators into your yard, and breathe easy knowing you and your family are a little safer from mosquito-borne diseases.